To evaluate the impact cirrhosis has on survival the records of 40 cirrhotic trauma victims from the registries of two Level 1 trauma centers were reviewed and probability of survival calculated using the TRISS methodology. Mechanism of injury, anatomic location, involvement of single or multiple sites, presence of ascites, elevations in serum glutamic oxaloacetic transaminase (SGOT), alkaline phosphatase, serum bilirubin, prothrombin time (PT), and hypoalbuminemia were tabulated for each patient. Contingency tables were created for injury and hepatic parameters, as related to survival, and subjected to chi square analysis. Loglinear analysis was performed on all significant parameters to evaluate the independent effects of injury characteristics and hepatic insufficiency on survival. Predicted survival was 93%; observed survival was 70% (Z = -6.92; p < 0.001). Cause of death was multiple-system organ failure (9) and closed head injury (3). Admission markers of poor outcome included one or more of the following: ascites, elevated PT or bilirubin, history of motor vehicle accident, multiple trauma, or blunt abdominal trauma requiring laparotomy. 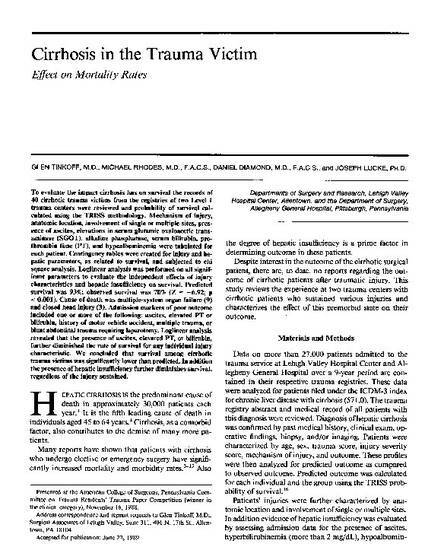 Loglinear analysis revealed that the presence of ascites, elevated PT, or bilirubin, further diminished the rate of survival for any individual injury characteristic. We concluded that survival among cirrhotic trauma victims was significantly lower than predicted. In addition the presence of hepatic insufficiency further diminishes survival, regardless of the injury sustained.